King College Prep students take a quiz in AP physics on Thursday. The school has been adding AP courses and now has 15 courses compared to 11 three years ago. 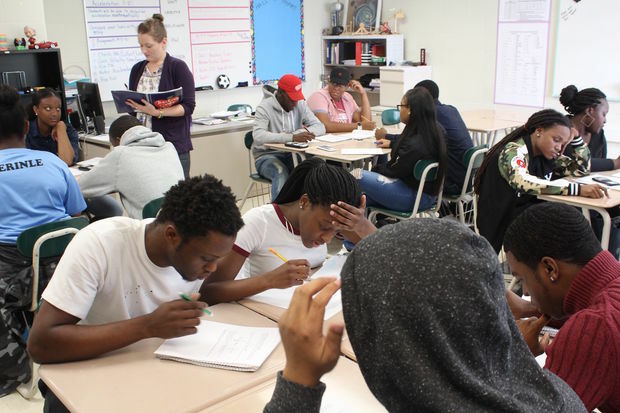 KENWOOD — King College Prep is the only selective-enrollment school in the city to see its enrollment numbers drop substantially this year, despite students there doing better than many of their peers at other selective-enrollment high schools. King, at 4445 S. Drexel Blvd., was expecting enrollment to grow from 642 to 653 students this year, but instead saw enrollment drop to 598 students. This is now the third straight year enrollment has dropped at the school while most other selective-enrollment schools have seen enrollment grow. King Principal David Narain, who has helmed the school since 2013, said the school continues to battle an association with violence since the 2013 off-campus shooting death of sophomore Hadiya Pendleton. 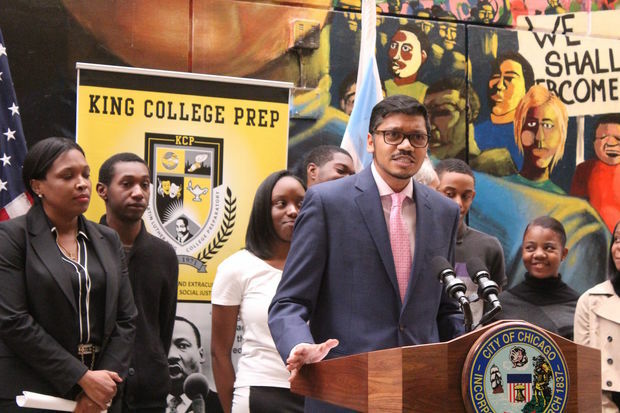 King College Prep Principal David Narain said the school continues to fight negative associations that he believes have led to declining enrollment at the high school. The school was turned into a selective-enrollment campus in 2002, but decades of being known for athletics more than academics in Kenwood have proven hard to shake. The death of sophomore Hadiya Pendleton in 2013 several blocks away in Harsh Park continues also weighs on the school’s reputation and reinforces negative views of the school, its students and their neighborhood, Narain said. Investigations into Pendleton’s death revealed the gunman was likely unconnected to King and shot at Pendleton and other honors students at the park six blocks from the school because they were mistaken for members of the 4-6 Terror gang. Perceptions of the school had already taken a hit a year before Pendleton's death brought national media attention to the school. In 2012, hundreds of students staged a sit-in over disputes with then-Principal Shontae Higginbottom over harsh disciplinary policies and Higginbottom's firing of a popular basketball coach and having him arrested. Narain said those incidents are what people know about the school’s recent past, while consistently higher test scores and more college admissions have not made headlines. King freshmen rank among the highest of those on track to graduate on time among selective-enrollment schools, and the school has seen steady growth in already high graduation rates and college enrollment stats. "Martin Luther King Jr. High School provides an excellent education as a [top-ranked] school, and we believe in the school community," said Emily Bittner, a spokeswoman for CPS. "We are totally committed to continuing to invest in King, most recently with its engineering program. " Narain said the school has increased its number of Advanced Placement classes to 15 from 11, and 80 percent of students now take at least one AP course. He said he’s convinced consistently solid academic performance by students will persuade more students to come to King. He said he’s trying to get as many potential students and their parents as possible to come in and see King College Prep, including at an open house from 9 a.m.-noon Saturday, so they will pick King over suburban or private schools if they don’t get their first choice of selective-enrollment school. Narain said the potential pool of students continues to shrink as more students leave CPS for the suburbs or private school.